It's Thanksgiving Day tomorrow, my favorite American holiday of the year. I have a friend for whom this will be her first Thanksgiving since adopting a whole-food plant-based diet and after talking to her about what was ahead in joining her family at the annual feast it made me think about how food is so tightly wound up in any culture. On Thanksgiving Day in the U.S. it’s all about “the bird”. Without turkey on their Thanksgiving tables, many Americans would not feel that they have “celebrated” Thanksgiving at all. And I know this for a fact. I am a New Zealand-born U.S. citizen. I was 40 before I celebrated my first Thanksgiving eating turkey with some American friends who generously invited me to join them. In 2000 a different friend invited me to join her and some of her friends for Thanksgiving turkey and that became a tradition of taking turns at hosting that lasted 13 years! The others in the group, all American-born, would of course never think of not serving turkey. But when it was my turn I always thought it was a great chance to break the mold and celebrate with something else. In those days I was still a meat-eater, so it was beef one year, lamb another. 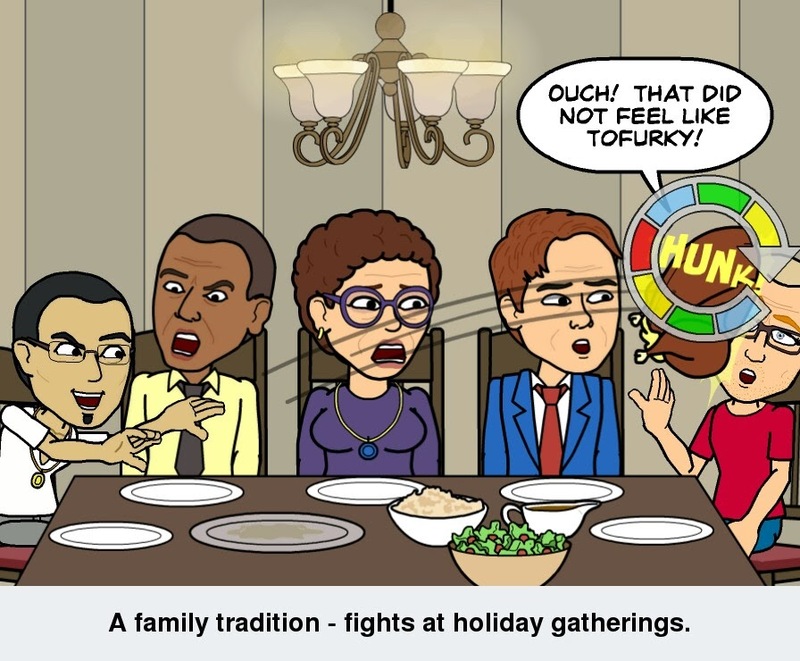 On the occasions I cooked, my guests had a separate Thanksgiving dinner for themselves either the weekend before or the weekend after at which they ate turkey. If that doesn’t prove my point that an American can’t feel like they have celebrated Thanksgiving if they haven’t eaten turkey I don’t know what would. This is a good illustration that what we eat is just so strongly tied to our culture. You could even say it’s just “not kosher” for an American not to eat turkey on Thanksgiving. Although the Founding Fathers didn’t write it into the Constitution, they might as well have: Thou shalt eat turkey on Thanksgiving Day! So that leaves those of us who chose to eat a plant-based diet well and truly outside the mainstream on Thanksgiving Day. Well we know that already, but on Thanksgiving we will know it even more. We will be tolerated at the table, but some of us will probably not be accommodated at the table at all. Many of our hosts have never cooked anything "vegetarian" let alone heard of "whole-food plant-based" and what that entails, and they are not about to start learning on Thanksgiving Day, a day they are stressed out as it is. There might be some digs in our direction about what we choose to eat. In recognition of the spirit of the holiday they will hopefully be subtle. But for some they will possibly be head on. We might as well be announcing to our Christian families that we have converted to Islam; our Jewish families that we have converted to Christianity; our Moslem families that we have converted to Judaism. We are breaking our cultural norms. We are apostates and heretics! How would I suggest you survive Thanksgiving as the heretic at the table? Here are some things to consider – just my opinion, mind you. That’s what everyone else is doing, so we need to do the same. Do not put yourself in a position where you feel like you are left out and your friends and family can feel that you are a “Double-P” - pitiable and pitiful. If your host hasn’t asked you what they could prepare for you and you just know that every animal that came off the ark is going to be lined up on that table, then bring your own food – including desert. Be sure to tell the host/hostess ahead of time and ask them if it's ok with them. Explain to them that you will need to heat up your food, but will keep out of their way and do so only when it works for them. Make sure what you bring is something special and celebratory, and something that will make everyone else want a bite. Refuse to share! If you’re not into cooking, then buy readymade food from Whole Foods, Mother’s Market, Trader Joe’s, or the like. If you don’t have any of those stores in your area, then consider veestro.com who deliver frozen vegan meals to your home. Don’t bring food that is going to require you take over the kitchen from the host/hostess. No need to give anyone any points to gossip about when they relate their story about the weird in-law at Thanksgiving. They already feel they have enough points up on you as it is. You may be asked about your diet, why you can’t eat turkey on Thanksgiving, or even possibly be attacked head-on by someone. Hey, families feel they have the right to do that, and what better time for a fight than on a holiday! It’s a tradition! Try to deflect and minimize. For me it’s easy enough in that my primary motivation is my health, so I just say I do it for my health, that I cured my problem with high cholesterol by changing my diet. To argue against that is to argue that I should set out to knowingly harm my health. Most people are not going to do that. Have a personal moment of silence for the animals. It will make you feel better! Find a quiet moment and say a prayer of thanks for all the animals that gave their lives. Say “I’m sorry”. Ask for forgiveness from all the animals who lived through lives of confined captivity and deprivation followed by a fearful and possibly painful death only for many of them to have their flesh discarded in dumpsters and trash cans. Don’t make a show of it, but believe me, you will feel better and stronger in yourself. As I said, I am not an “ethical vegan” although I am a strong advocate of animal rights and do all I can when I can to help stop factory farming. I am someone who adopted the WFPB lifestyle for personal health reasons. I will not be eating any animals of any kind on Thanksgiving, but if you find the pressure just too hard to take, then consider accepting a “No thank you” helping. That’s what a friend of mine calls a small taste of something she doesn’t really like or want to eat. If you decide to do this, promise yourself that it’s a one-time thing. And I forgive you! Happy Thanksgiving to all my readers in the United States! And wherever you are in the world, let’s be grateful for our health, and work each and every day to preserve and protect it with a nutritious whole-food plant-based diet.